Today I’ve joined with a group of bloggers to share our favorite comfort foods. My favorite comfort food is a potato recipe that my mom, like her mom before her, makes every year around this time using new baby garden potatoes. Do you ever wonder if the foods your mom ate when pregnant influence which foods you love today? Do those foods bring you more comfort than others? I think they must. I first tasted this potato recipe before I was born. My mom didn’t tell me that. I just know it’s true because she makes this recipe every August and I was born in September. Late in August my mom heads out to the garden and tugs a potato plant from the mud. If 1 to 2 inch globes of starch are clinging to the roots, she knows it’s time. She gathers the potatoes into her basket and then zig zags her way out of the maze of plants, snagging handfuls of dill fronds as she goes. Picture taken by my mom, Phyllis Pittman, late summer 2013. She brushes the dirt from the potato skins, washes them and then boils them in well-salted water. While the potatoes cook, she sautés onions in too much butter, adds too much cream and then throws in way way way too much fresh dill – more dill than you could ever imagine for a single recipe. I don’t currently have my own garden and new baby potatoes are hard to come by. I find that small red potatoes are a great substitute. 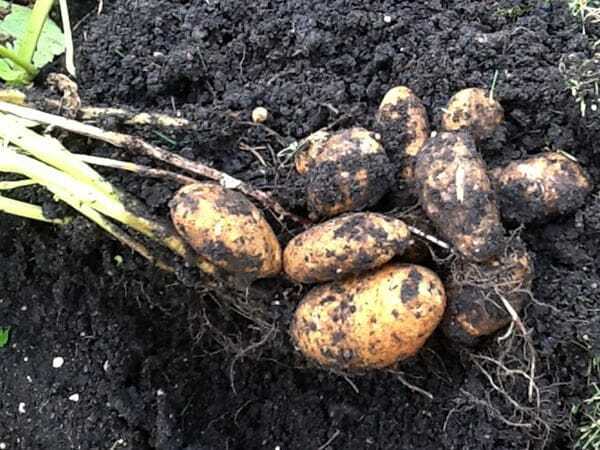 They don’t have that earth-tinged just-yanked-from-the-roots taste of new potatoes but they do have the tender skin. And they look really pretty covered in green dill. The potatoes are drained and then folded into the oniony, buttery, creamy, dilly dilly dilly mixture. That’s how my mom always makes new baby potatoes at the end of summer. And that’s the taste of comfort to me now. I just realized that my baba used to make this potato recipe too. And since my mom was born in September, I bet that she, like me, first tasted these potatoes before she was born. This potato recipe stuck with my mom and I’m glad because there are few things in life that bring me as much comfort as a bowl of creamy dilled new potatoes. 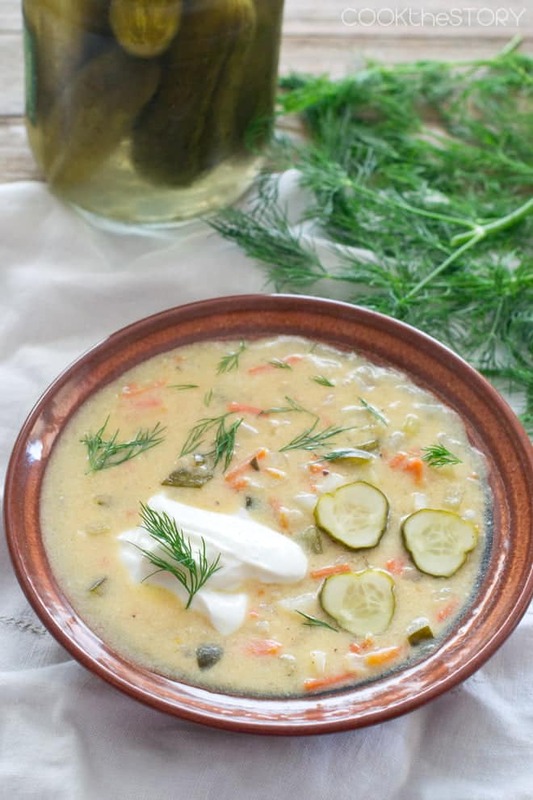 If you love dill as much as I do, be sure to also check out my soup-in-15 recipe for dill pickle soup. The creamiest, dilliest potatoes you'll ever eat. Put the potatoes in a medium saucepan and just cover with cold water. Add 2 teaspoons of the salt and stir. Over high heat, warm to a simmer. Reduce heat to low. Stir and then partially cover the pot. Simmer the potatoes until the are fork tender, 5-8 minutes. Meanwhile, in a large skillet melt the butter over medium-low heat. Add the onion and cook, stirring occasionally, until translucent, 3-5 minutes. Add the whipping cream and remaining 1/4 teaspoon of salt and the pepper. Stir. Increase the heat to medium and bring the cream up to a boil, stirring constantly. Reduce the heat to low and add the dill. Drain the potatoes and add them to the skillet, using a spoon to turn them over in the cream sauce. Here are all the wonderful comfort foods that the other bloggers are sharing today. 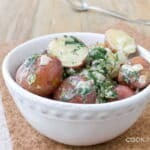 Now scroll down to the comments and tell me, is there a particularly comforting potato recipe (or any other recipe) that you’re pretty sure you tasted before you were born? Do you think the foods your mother ate before you were born influence your tastes today? This recipe was amazing! I was looking for dill recipes – I have so much dill in the garden. I’m so happy this was the first recipe I made using the fresh dill because I’m making it a 3rd day in a row. Big hit! So creamy and flavorful. Thank you so much for this! Jalco, I’m so happy you like it. It’s one of my favorites! I’m wondering how these are the next day.. Can you reheat them without ruining the cream? There is an event that I need to cook for but it needs to be done the night before. Any feedback? Monique, Yes, you can reheat them the next day. Do it slowly though, whether you use the microwave or stovetop or oven. Stir regularly but gently so as to not break up the potatoes. 1. The potatoes (I was able to get new potatoes at our farmer’s market) ended up cooking closer to 15 minutes than 5 minutes. 2. The cream reduced very quickly, so I ended up using almost twice what the recipe called for in terms of cream. To correct this, I also ended up using about double the salt and pepper from what the recipe called for. 3. 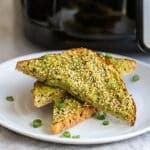 The amount of dill in this recipe is PERFECT! I love dill but was questioning the whole cup of dill. Don’t question it – love it. It’s amazing. Thanks for sharing. I’ll definitely make this again! Beth, Thank you so much for your feedback! I’m betting that our potatoes had some differences in density and size. As to the cream reducing quickly, I’m not sure. I keep the pan at low until the onions are done and add the cream at that point. The low temperature doesn’t get it going much. Then I turn it to medium just until it bubbles. Having said that, when I make this dish I’m trying hard to get the cream in while not having to add too much of it. It would absolutely be better with more cream! And the dill: I know! Crazy, right? 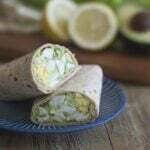 I found this recipe when I was looking for a way to use all the fresh dill I have in my garden. It’s simply delicious! Thanks for sharing! I love potatoes and dill! 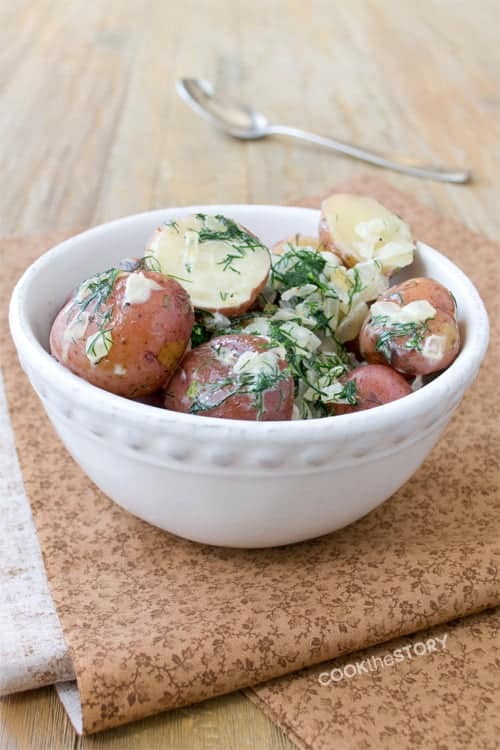 The only potato salad I make has tons of fresh dill in it, as well as some chopped dill pickle. I never put dill pickle in my potato salad. What a great idea! I am sure I tasted just regular boiled potatoes with gravy before I was born. Also many, many authentic Danish Pastries. I was Born in Denmark, to Danish parents. I am also sure there were many items from smorgasbords I tastes too. Anny, those sound like wonderful first tastes to have. I’ve always wanted to try a traditional smorgasbord. I’ve always been intrigued by the idea of all those tasty foods. Hash browns! With salt and pepper and melted cheese. Something so simple and perfect and yep. Pretty sure I ate this before I was born, lol. I LOVE hashbrowns with melted cheese. One of my favorite breakfast foods. Potato Surprise or Cheesy Potato Casserole – that’s what I love. What is Potato Surprise? Do you have a link you could give me? I’m intrigued! Yummy potato soup! I’m sure I tasted that before I was born. Still a favorite of mine today. Great giveaway! Potato soup is one of my favorite comfort foods too. I make it the way my mom does, with bacon. You put cubed potatoes onto boil in salted water. Then you fry chopped bacon and then add flour to the bacon fat that is rendered. Cook for a minute or two. WHen the potatoes are fork tender you pour the bacon-flour mixture into a pot, right in there with the water and the potatoes. Stir, taste, season and eat! Not much better than that. Come to think of it, I haven’t had that soup in ages. I just might make some this weekend. Potatoes are one of my fave foods, period. But I’ve always loved mashed potatoes; we had them quite a bit growing up (and not the fake from-a-box kind). Now I invariably add a bit of garlic and cheddar cheese for a little extra to my meals. And I do believe that there is a connection between what our moms ate while we were in utero. When she was pregnant with my younger sister, she couldn’t stand potatoes or carrots. To this day, my sister can’t stand those foods, either. That is so interesting about your sister! I’m going to ask my mom if there were any foods she disliked when pregnant and see if they match any of my dislikes. How fun! (Your mashed potatoes sound delicious. I love them too, plain with butter, salt and pepper or loaded up with other things. As long as they’re soft and potatoey, I’m a happy girl). Here’s something interesting. My mom never made shepard’s pie. Not sure why not. It just wasn’t something that I had growing up. But now I’m married to a Brit and so that is his comfort food. And it very very quickly became mine too. We have it often in the fall and winter. My mom’s potato soup was the comfort food of choice when it was cold outside!! I adore potato soup. It’s so warm and filling and soft. I can’t wait for colder weather so I can make up a batch. 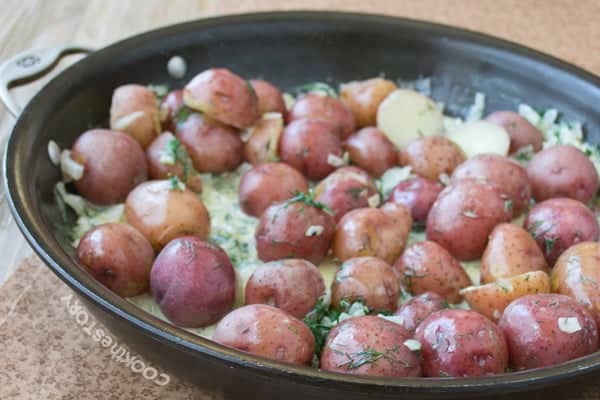 my mom makes baby new potatoes with sour cream sauce and dill..they’re delicious and really really creamy. probably they taste the same, ts just wth sour cream. I bet they’re very similar. I’m going to try making them with sour cream because I always always have that on hand and rarely have the whipping cream. It would be super convenient if I could get that comfort without needing a special ingredient. Thanks for the idea!! My Mother’s Potato pancakes with Applesauce. Odd because she is half Greek but I LOVE her potato pancakes. What sort of potato pancake does your mom make? Are they the really crunchy kind or the softer kind that has a bit of a batter to them? My mom and Baba made the latter and I love them that way, with sour cream instead of apple sauce. But I also do the crispy ones for me and my husband if we’re having smoked salmon for supper. A great pair! I’m not sure about potato recipes but my mom did eat a ton of slim jims and chocolate ice cream. I think it’s totally influenced my taste because I love both today for sure. She does have an amazing augratin potato recipe that she makes now that I love…its so sinful, lots and lots of heavy cream and cheese…yum! That augratin recipe sounds amazing! Any chance she’d share the recipe with me? I’d love to check it out. That’s funny about the slim jims and chocolate ice cream. I need to ask my mom what foods she loved when pregnant to see if it influenced me at all. My mother loved mashed and scalloped potatoes and I have a special fondness for them. My daughter adores Mexican food; when I was pregnant I desired Taco Bell bean burritos. Not so much for me, but my son definitely came out of the womb with a taste for Indian and spicy food. By 8 months he was eating finely shredded curry chicken and now at 4 years old regularly eats things like Sriracha flavored potato chips. I had major Indian and hot wing cravings while I was pregnant and ate both frequently. I can’t believe your son likes such spicy stuff. We tried giving our kids bits of spice when very young hoping they would acquire a taste for it but no dice. My son even complains that garlic is spicy. We keep trying with subtle little bits hoping that it will work someday. Now I’m wondering if I should have had more spicy food when pregnant. I had such bad heartburn though that I can’t imagine it was appealing at the time. Oh well! My kids don’t like potatoes much either, except idmf I roll mash into balls and make snowmen. And fries. With this recipe I rinse them and then cut them into mini fries. They eat them if I also give them ketchup *sigh*. Cream chipped beef. It’s an odd thing, but I love it. couple pieces of toast and a bowl of CCB to dip ’em in. Deeelicious! Amy, I don’t think I’ve ever had that before. Do you have a recipe link you could send me? Lauren, That sounds amazing. In high school one of my best friend’s mons used to make twice baked pitatoes with that cream cheesy mixture. Soooooo good! Has to be mesquite grilled beef fajitas on homemade flour tortillas with guacamole. My mouth waters just thinking about it. I only ever made homemade tortillas once. They were so amazing but I found it time-consuming. I wonder if practice would make it quicker. They sure were good! Thanks Brenda! That means a lot to me coming from you. Beef stroganoff, my childhood favorite. Oh Karen! I love beef stroganoff. I turn to it all the time for a comforting dish in the winter. I can’t wait for it to cool off a bit so I can dive into some. Dawn, That’s too funny! I love fries too, and almost all kinds. But my favorite are the homemade fries with the skins on served in a paper bag from a chip truck. I don’t find them in as many places as I used to but when I do, I eat enough to make up for it! Oh wow! Those sound so good! Love the sweet and spicy on potatoes. Yum! I love latkes too! Do you have them with apple sauce or with sour cream? I know people who do both. My family always did sour cream. What a lovely post about your Mom and her wonderful potato recipe! My mom’s roasted parmesan potatoes. New potatoes, butter, salt, paremesan cheese and fresh Italian parsley. Season with fresh ground pepper and you’re in potato heaven! I am so so so going to try that. Don’t be surprised if a version shows up on this blog at some point this winter. They sound so so good! 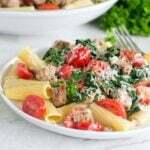 This recipe looks and sounds divine! Potatoes are the ultimate comfort food! I’m convinced that my mother ate a boatload of homemade mashed potatoes when pregnant with me, bc I cannot get enough of them, ever. I also blame her for my love of matzo ball soup. I didn’t have matzo ball soup growing up but have become a huge fan recently. There’s a Jewish restaurant near us that we go to quite often. I love their soup so much that I sometimes even order it for breakfast (with a corned beef sandwich). My husband thinks I’m nuts. But those matzo balls are so comforting and the broth must have schmaltz in it. I just can’t get enough of it! I’ve never tried making it though. Do you now of a good recipe? apparently my mom ate a lot of Mexican and Chinese…no potato stories that I’ve heard of! Do you love Mexican and Chinese foods now? Well, weird question, I guess. I mean, who doesn’t love Mexican and Chinese food? lol. But do you extra love them, do you think?